This is the next in a series of guest blogs on BRHP. The opinions expressed in it are of Mona Nilsson herself. Publication of these opinions in BRHP does not imply that BRHP automatically agrees with or endorses these opinions. Publication of this, and other guest blogs, is an attempt to support an open debate and free exchange of opinions on RF-EMF and health. The European Commission recently published a new expert report on the health risks from exposure to electromagnetic fields (SCENIHR). The brain tumour risks from mobile phone use are dismissed on the basis of a cohort study that is so biased that other scientists are surprised that it even got published in a scientific journal. The EU-report SCENIHR a scientific fraud paving the way for business as usual. On an issue where an increasing number of experts and scientists that are warning of growing evidence for serious health risks to the public, the European Commission appointed a small group of experts with 12 individuals that nearly all are known to peddle the thesis that there are no health risks from mobile phone use, radiation from mobile towers, wireless networks. Most of the 12 experts also have documented ties to the power or the telecommunications industry. The chairman of the SCENIHR working group serves as an example how the EU-commission handles an issue where there are huge economic interests in conflict with public health interests. It’s chairman Theodoros Samaras is a member of the IEEE which brings together representatives of the military, telecommunications and electrical industries and recommends standards for human exposure of great economic and strategic importance to the industry. In the years 2010-2012 Samaras was consultant to Vodafone Panafone a telecom operator in Greece. He is an advisor and a former employee of IT’IS a Swiss organization funded by the major telecom companies. Of the other experts responsible for writing the report (working group), most of them also have some ties to the industry that would be very much affected by and conclusions about health risks. Several of them are also involved in the organization ICNIRP, that like IEEE sets limits of great economic and strategic importance to the industry. The section on brain tumor risks from mobile phone use in the SCENIHR report can serve as an example of how the experts failed to present the available science in an objective and accurate manner and thus how the European Commission handles an issue where the potentially serious health risks for hundreds of millions of EU citizens stand against the risk for the economically powerful telecom industry that brain tumour risks are officially admitted. Since then, the evidence of increased brain tumor has rather grown stronger: Two independent studies have confirmed the earlier findings that 20-30 minutes of cell phone use every day over a period of period of time is sufficient to increase the risk. A few weeks before publication of the SCENIHR an other analysis of the available science by four other experts (Morgan, Miller, Sasco, Davis) concluded that there are increasing evidence for brain tumour risks and the radiation should be classified “probable carcinogen” class 2A. It is primarily the much discussed updated Danish cohort published in 2011 in combination with brain tumor statistics from the Nordic countries cancer registries that is referred to as evidence for the no-brain-tumour-risk claim. However the Danish cohort study is probably the most flawed study ever published and the brain tumour statistics point in different directions. The Danish cohort is so flawed that it is useless for any conclusion about brain tumour risks or any other health outcome from mobile phone use. The main reason is a huge misclassification of exposure that left the study to compare if a large group of mobile phone subscribers were at higher risk of brain tumours than another large group of mobile phone subscribers. This was done without considering actual amount of use or exposure. Of course the result of such a study will be no increased risks. The Danish cohort study, initially funded by mobile operators in Denmark and an American consulting firm, IEI, covered more than 358,000 Danes who had signed private mobile subscriptions between 1987 and 1995. The study compares if these subscribers had higher incidence of brain tumors compared to rest of the population (in Denmark over 5 million) by 2007. The study has no information on how much each person used the phone or for how long the subscription was actually maintained. The only parameter of possible exposure is the time that has passed since each individual subscribed the first time. Are mobile phone subscribers at higher risk than other subscribers? 200,000 Danes with company subscriptions during the period 1987-1995 were excluded and ended up in the comparison group that should be “unexposed”, i e not using mobile phones. This is by far the largest user group at that period. As an idea, in the late 1990:s a person with company subscription used a mobile phone six times as much as a private subscriber according to statistics from the National Post and Telecom Agency in Sweden. If we assume that there was the same situation in Denmark, this means that there were considerably more exposure in the “unexposed” comparison group already at the start of the study! But the exposure in the unexposed comparison group grew even more by each year that passed since 1995. All those who began using a mobile phone after 1995 also ended up in the comparison group. The “unexposed” comparison group grew to over 100% subscriptions by 2007 (more than 1 subscription per inhabitant), the cut-off date of the Danish cohort. Practically everybody was exposed in the “unexposed” comparison group. Between 1996 and 2000 the use of mobile phones in Denmark exploded. By 2000, the number of mobile phone subscriptions grew to 3.54 million. This means that in the unexposed comparison group roughly 3 million people were prone to have used a mobile phone for 7 to 12 years, quite sufficient, according to case control studies available, to increase the risk of brain tumor. If we make the assumption of shorter latency periods for intensive users (i e 1-4 years as shown by Interphone, Coureau, Hardell) there were 5.4 million subscribers in Denmark by the end of 2005, two years before the cut-off date of the Danish cohort, equal to the Danish population of 5.4 million inhabitants (Telecom statistics – second half of 2007; IT-og Telestyrelsen, Danmark). The most biased study ever published? Criticism of the investigation has been tough. Prof. Dariusz Leszczynski, has asked in an article in The Scientist that the study should be withdrawn from publication. He asks how it is possible that the British Medical Journal could even consider publishing such an improper study. “How is it possible that the British Medical Journal allowed such a poor quality peer review? Were the peer reviewers incompetent or did they have conflicts of interest? What was the involvement of the BMJ’s editors? Why, once alerted to serious design flaws by readers, have BMJ editors not taken any action? “Rules out” risks – Really? Despite the obvious faults with the Danish cohort the SCENIHR report group ignores them and claim that together with brain tumor statistics from the Nordic countries “exclude” that the risk would apply to large parts of the population. However the Nordic brain tumor trends point in strikingly different directions which is, again, ignored by the authors although it must be known by Dr Joachim Schüz in the SCENIHR working group. Dr Schüz is coauthor of both the Danish cohort and the incidence article referred to in the SCENIHR report. In Denmark, the number of new cases of brain tumours per 100 000 population increased by over 40% between 2003 and 2012. This means 562 more cases of brain tumors in 2012 compared with 2003. However, the trend has been flat or nearly falling in Sweden, while it increased more moderately in Finland and Norway. The increase in Denmark is not restricted to the old. An objective conclusion is that brain tumour incidence trends must be examined very critically with a thorough analyze of the reliability of the register’s before any conclusions can be drawn. The Swedish registry on brain tumours have documented problems of under-reporting. In addition, the number of people who was treated for brain tumor of “unknown nature” and dying of a brain tumor of “unknown nature” in Sweden has increased since in 2008. This increase is not mirrored in the cancer registry, thus probably not reported. Another issue is on the ethical level: should decision makers responsible for protection of public health really demand that many must die (the crude reality behind the clear trends on malignant brain tumours), before taking steps to alert the public to the dangers of a widespread and increasingly used technology? My opinion it is an unethical argument raised by the SCENIHR experts. I must also comment on the false presentation in the SCENIHR report of the study on brain tumours and mobile phone use among children aged 7-19 years in four different countries (Sweden, Norway, Denmark and Switzerland). This study was also funded by the mobile phone industry via the Swiss Research Foundation on Mobile Phone Communications. The study indicated increased risk of brain tumors among children who used a mobile phone. Almost all calculated OR:s are elevated (although not statistically significant): 100% in Table 2, 90% in Table 3 and 83% of Table 4. There was also a 115% statistically significant increased risk of brain tumors in children who had a mobile phone subscription for the longest time period. But the increased risks are downplayed in the SCENIHR report. The main argument is again Swedish brain tumour incidence trends – and this time only the Swedish time trends although the study covered 4 countries. If the experts in the SCENIHR committee that accepted the working groups presentation of this study had made a thorough analysis of the Cefalo study they would perhaps have found that this statement is false or even scientific fraud. The Cefalo researchers, among them again Dr Joachim Schuz also in the SCENIHR working group, only included the first three years of cordless phone use, an important fact only presented in the third footnote under table 6 in the published study. The cumulative duration of calls and number of calls is limited to the first three years of use! By doing so there is no way that that any conclusion about the risks for those children with the highest cumulative use can be made because this information is simply not there. It was intentionally excluded. Let us take the example of an 18-year-old adolescent who used a cordless phone since the age of ten. Only use in the first three years (10-13 years) are included, even though the teenager later multiplied the phone time (as most teenagers do). According to epidemiologist and oncologist Lennart Hardell, who has consistently found that cordless phones use increase the risk of brain tumor, this method leads to an underestimation of the obtained risks. Lennart Hardell has shown in one study that teenagers increase speaking time with increasing age. Joachim Schüz told me back in 2011 that they limited the exposure to the first 3 years because they wanted to examine the risks associated with the use in “kindergarten” (small children). Martin Röösli argued that you cannot examine everything in a single study and that they wanted to investigate the long latency periods for wireless telephones and short latency times for mobiles. Maria Feychting at the Karolinska Institute who also participated in the Cefalo study from Sweden argued in a written reply to the Karolinska that they had to ask that question about the first three years of use otherwise they would not get accurate information about cordless phone habits during the relevant time period, that is likely several years before the tumor was diagnosed. According to one member of the SCENIHR working group, Kjell Hansson Mild, one person was in charge of drafting the section on cancer risks. It was Dr Joachim Schüz also author of the Danish cohort study and the Cefalo study. Dr Schüz is also coauthor of the articles on incidence of brain tumors in the combined Nordic countries and he has particularly good insight into the Danish brain tumour statistics from his former position at the Danish Cancer Society. In 2009 he presented the Danish brain tumour (glioma) incidence trend at a conference in Umeå (Session_Shuz umeå). The trend ended in 2003. 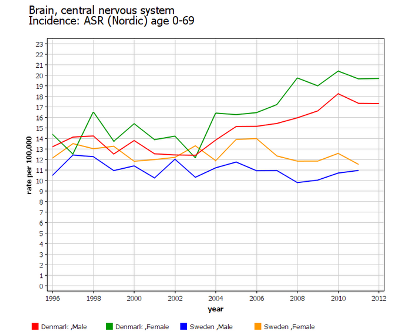 Thereafter incidence trends for brain tumours increased in Denmark. In the presentation in Umeå Dr Schüz also presents, on page 2, how cohort studies should be done: comparing diseases in one group of exposed with another group of unexposed. This is a simple rule that was completely mixed up in the Danish cohort. He compared exposed with exposed. The report forms the basis for the European Commission’s decision if there are reasons to regulate the wireless products and technology or not. It is a clear success for the industry as it gives the green light for further and continued expansion without any restrictions, regulations or necessary information about health risks to the public. The loser is public health, in other words virtually the entire EU population of 700 million individuals. It is not only on the radiation issue that the EU-Commission fails to put people’s health ahead of powerful industrial interests. Corporate Europe Observatory, which examines the industry’s influence over EU policy, published in September 2014, a report which concluded that the EU expert reports are often dominated by experts with ties to the industry concerned. It further noted that the EU rarely forms balanced expert groups and that diverging opinions often have problems to make themselves heard.